Oh, I can’t tell you how pleased I am to be hosting Sarah Granger today as part of the A Minor Inconvenience book tour. I recently reviewed her wonderful M/M historical romance and I couldn’t sing its praises highly enough! I’m not the only one, either! Gay Guy Reading Reviews calls it ‘a breath of fresh air’, and I have to agree. I consider A Minor Inconvenience one of the best M/M romances I’ve read in 2014. 🙂 Be sure to read through the entire post to find out how you can enter the Rafflecopter for some cool prizes! Welcome to my website, Sarah! 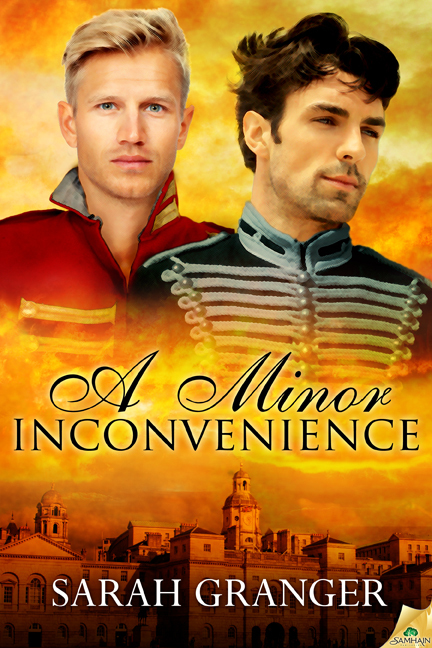 I’m delighted to have you here today, sharing with us something about your historical M/M romance, A Minor Inconvenience. I’ve been looking forward to this interview and book tour so much! I can’t say enough wonderful things about this story, but I want to make sure that I don’t get too spoilery here. I want everyone to read this story and enjoy it as much as I did! First, a couple of questions about this particular story. Correct me if I’m wrong, but A Minor Inconvenience takes place at the time when Napoleon escaped from Elba and started a second campaign, is that correct? What was your inspiration for this story? Thanks for having me here, Sarah, and I’m truly delighted that you enjoyed A Minor Inconvenience so much! The book is set in 1813, though the date isn’t mentioned in the book itself. It’s actually just before Napoleon was banished to Elba, taking with him an eye-watering number of his favourite horses, but not, so far as I’m aware, his wife. My choice of year for the book was in some ways a little random. It needed to be far enough through the war for campaigning to have taken up most of Hugh’s adult life, but my ultimate choice of 1813 was due to my rather wistful longing that none of the military men who returned to the Peninsula after the events of the book would face too much more war. As for inspiration, I wanted to write an M/M Regency and I have something of a weakness for military uniforms. That led to the overall concept, but once the characters came into being, they shaped the story in somewhat different ways from those I’d envisaged. So I guess my original moment of inspiration was down to those darn military uniforms! Hugh is such a wonderful character! He seems like such a deceptively simple man, which is probably why so many underestimate him, including members of his family. He leads a quiet life and had has fairly low expectations for life outside the measures decreed by society. He believes in honor and duty: duty to his country, his family, and his position in society. He is a fairly self-contained man as well, but this doesn’t mean he is dull or without brains. These fundamental characteristics are what make it so tremendous when he decides to go against everything he believes in for love. What was it like to write such a character? Were you ever concerned as to how he would be perceived by your audience? In a word, yes! You’ve summed him up so beautifully here. I was definitely worried that people picking up the book might take him at face value – which might also lead them to question what qualities he possessed that could attract Theo. As you say, he’s deceptively straightforward and one has to look beyond his self-perception to see who he really is. But each time I wondered if I could persuade him to be a little more forthcoming and open, it was very clear that doing so would violate his character. By necessity, Theo had to remain a bit of a dark horse in this story, yet he comes across as a completely three dimensional character. Did you create a backstory for Theo in your mind when you were writing this? Why M/M romance? What’s the attraction there for you? I find that a difficult question to answer because I don’t really know. 🙂 When I first started reading M/M, there was just something about it that appealed to me straight away. As a writer, I struggle with the concept of writing a female main character I like – even while part of me is curling up in horror at that statement. I think what ultimately attracts me is something in the different dynamic between two male main characters, and the way M/M relationships aren’t bogged down with the same societal baggage as M/F. Why historicals? Is there a particular period in time that you feel drawn to, and if so, why? Once having thoroughly researched an era, do you find yourself drawn to writing other stories in the same time frame? I grew up reading Georgette Heyer, so the Regency is always going to have a special place in my heart. I love the formality of it for its own sake, but also for the way in which all that unresolved sexual tension bleeds through. It’s also close enough to our time to be able to write in a reasonable facsimile of the language they used rather than being faced with the choice whether to render old speech into today’s idioms or to try and make it sound somehow ‘old-fashioned’ without writing it in Middle English! I definitely hope to write more stories set in the Regency. I love Regencies, and the thought of writing M/M Regencies opens up all sorts of exciting possibilities. Have you written in other genres besides M/M romance? Besides historicals? My books so far are all M/M. My first novel was a contemporary, set in the world of professional tennis. As with A Minor Inconvenience, it required quite a lot of fact-checking, but I can truthfully say that the research was a sheer joy from start to finish. I mean, going back and rewatching some of my favourite tennis matches on YouTube and not feeling guilty for wasting time? It doesn’t get much better than that! What is the most difficult scene you’ve ever written and why? What was the most fun? I think the scene I struggled with the most was when Theo tries to explain himself to Hugh in the carriage. Finding the right balance between Theo saying enough for readers (if not Hugh) to understand while keeping true to his character and period was difficult. I ended up wanting to throttle the pair of them for being so oblique in their conversation! I’ve had an absolute blast writing Hugh and Theo, but my vote for the scene I had most fun writing has to go to Ryan in The Unforgiving Minute and his observations when he’s been given morphine. He’s a fairly stream-of-consciousness narrator in any case; removing such filters as he has was instructional, to say the least. I thoroughly enjoyed this book and all the characters in it! Will we see more from Hugh and Theo? Lady Emily? What are you currently working on? Tell us a little bit about your next story and the writing process for you as well. What can readers expect from Sarah Granger in the future? Well, I’ve just made the very difficult decision to shelve the story I’ve been working on for some time, and the reason for that decision ties in directly to my writing process. I wrote it because it fitted with a submission call, not because I had characters turn up in my head and demand that I tell their story. The story’s quite enjoyable, I think, but I’m not happy with it, despite a massive rewrite and an eye-watering number of tweaks. That’s not to say elements from it might not find themselves reworked in another book. Thank you, Sarah, for joining us here today! I have to point out that one of the BEST parts of a Regency M/M romance is breeches and how well they show off the male form! I’d long known of the practice of some women in that era dampening their muslins in order to define their, um, attributes, but I was unaware (until I read your blog posts) that men did the same to highlight their—assets. 🙂 Long live the desire to show strut your stuff! This entry was posted in Uncategorized and tagged contests, guest blog, interviews, reviews, Sarah Madison, writing by Sarah Madison. Bookmark the permalink. I’m impressed that you write what feels right to you instead of what may be easier to sell. I think that shows in a story. Sarah Granger recently posted..The book tour continues, and I don’t want it to end! I think that’s the most important part, Sarah! Because if it isn’t something *you* want to read, then it’s not likely others out there will fall in love with it! The passion does indeed shine through! So, breeches, coats so tight that gentlemen needed a valet’s help (or that of another willing gentleman) to undress, and then the boots. God help us, the boots. Is there anything anyone *doesn’t* like about Regency clothing? I’d love to know! Always a delight to have you here. Anytime–my pleasure! I may just be cackling evilly and rubbing my hands in glee. I can’t wait! Hah! It’s all your fault, missy! You and your discussion of breeches! 🙂 Well, the posting date is May 27th, so I will let you know when it goes live! Always a pleasure to work with Virtual Writers and their authors! I’ve been introduced to so many great new-to-me writers through you guys! I really enjoyed this. Nice Job ladies and cheers for a successful book tour. Thanks, Scott – and thanks again for being part of it. I’ve had a ridiculous amount of fun doing this tour, and Sarah (t’other one, obviously) always asks such interesting questions. I think there’s something about the tension between the unpredictability of m/m relationships coupled with the conventions of Regency that’s really compelling! Me too! I recently read an article in which someone remarked on the fact that historicals brought an edge to dynamics of m/m relationships because of the social conventions–and the great risks involved. I must confess, I’ve long been a fan of the Regency genre, but there is a sweet kind of hotness to m/m Regencies that I adore! I tend to forget how much I love historical fiction. Thank you for reminding me! This sounds like an intriguing story. Thank you for a chance to win a copy! Carly Rose recently posted..Blog Tour and Review: Three Rules by Marie Drake + Giveaway!